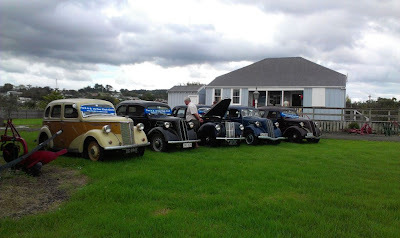 We met early Sunday morning at Kumeu and drove from here out to Helensville Historic Museum for their Display Day (organised by the Kaipara Classic Car Club) via the back road - a pleasant 30 minute drive that comes into the back of Helensville. After parking in the grounds, Karen and I wandered into town for coffee, and then ambled around all the shops before making our way back to the Museum. The Museum display; Brian and Bev's 7Y at far right. The rain held off until just before 3pm, whereupon we retired to the Kaipara Classic Car clubrooms for the prizegiving. 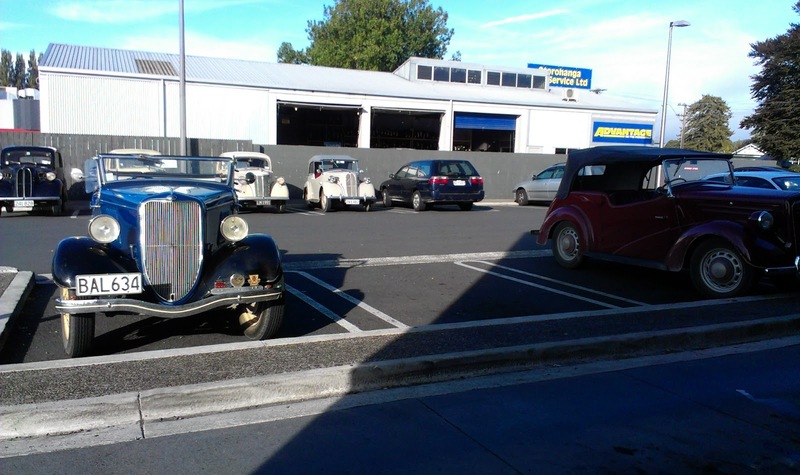 Brian and Bev's 7Y took out the trophy for Best Original Car; John and Jan, and Steven got medals for furthest distance travelled; and Bud received a medal for oldest attendee (despite his protests that he's only a young fella). As the rain continued to pelt down, we said our thanks and left for home. Finally, a slightly later start to the day with a short(-ish) run back to Auckland. 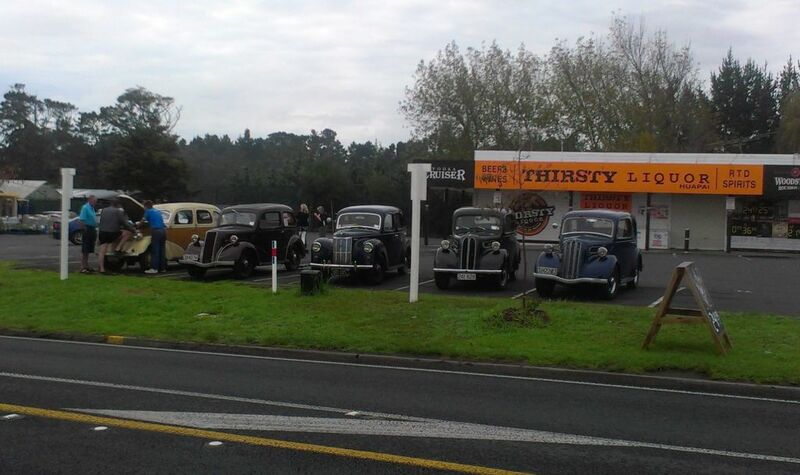 We drove from Te Kuiti to Otorohonga for a McDonalds breakfast, which Bud enjoyed immensely. From Otorohonga, we took the road through Pirongia and regrouped at Ngaruawahia, then on to Pokeno for a food break. With the rally essentially over, we each then carried on home, with all vehicles having successfully completed the journey. Today we began the return journey to Auckland, via the Forgotten World Highway. We left Wanganui early to regroup and fuel up at Stratford. 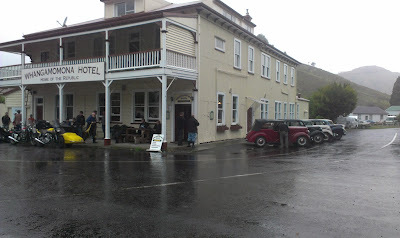 It was raining as we left Stratford and crossed the 3 saddles before a filling lunch at Whangamomona Pub. The rain had stopped when we left Whangamomona, we proceeded further on some of the smoothest gravel road I've experienced - smoother than the previous tarmac. 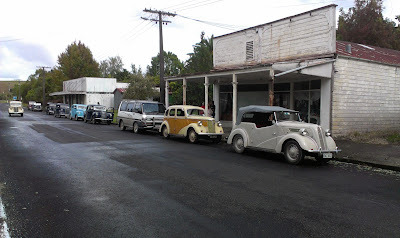 Pulling into quiet Ohura, we had the museum opened especially for us. 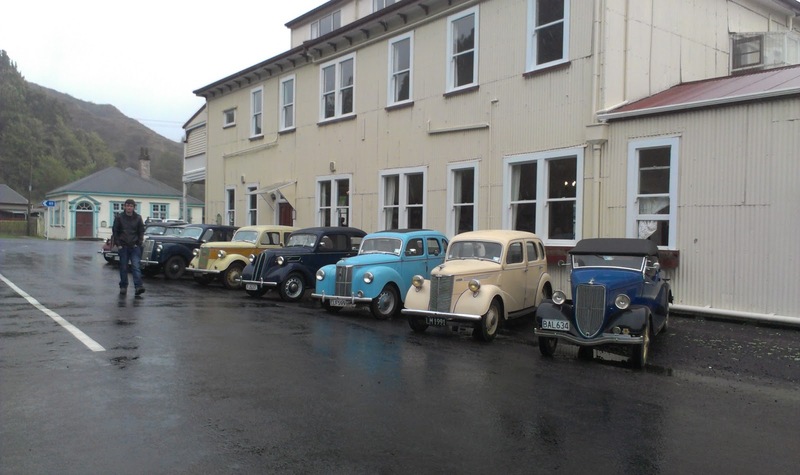 From Ohura we quickly rejoined the main highway and finished our day with fish and chips in Te Kuiti.